I start this new topic because I have some problems for a project I have been assigned on. First, you have to know that I am pretty new to everything concerning electricity, electronic, chips, sensors, etc... I have only done so programmation on C++ before, that's all. My assignement is to connect, as the title says, a NodeMCU v1.0 ESP-12E to a LDC1614 (http://www.ti.com/product/LDC1614/datasheet) using the I2C protocol. I have been looking a lot for different tutorials and other documentation on the net but I am still not able to perform what I would like to do. 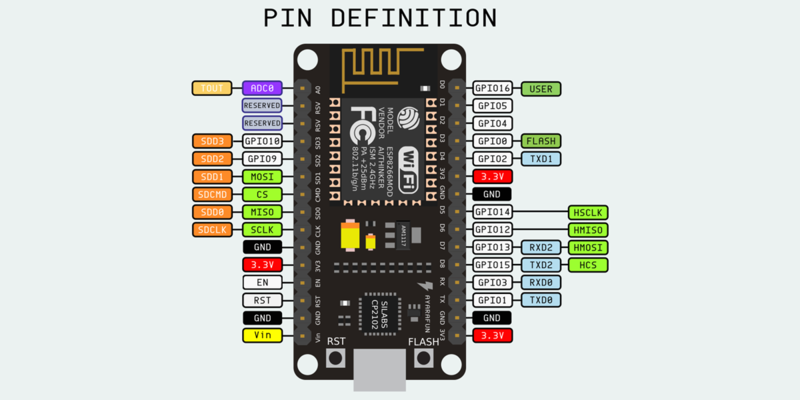 On a breadboard, the NodeMCU is connected to my computer via an USB-cable. On the right side of the image, the 3v3 pin is connected to the + of the breadboard and the GND to the - . The D5 is connected to the SCL pin of the LDC 1614 and the D6 to the SDA's one. Apart from the SDA and SCL, the ADDR is connected to ground ( page 3 of the datasheet ) so the address of the LDC1614 will be 0x2A, SD is connected to ground and the INTB is connected to the + of breadbord. but no device has been found so far. If anything is missing in my explanation, please just ask me and I'll give the information. I found the answer, I had to connect the SDA on D2 and SCL on D1. I know your post is 3 years old, but thanks for posting the resolution. I've downloading libraries and trying things with no luck. Your solution resolved my issue.